Lorna Bell is one of those girls who live on the sidelines of life. She comes from ‘a bad family’ and her peers think she is a thief. It seems that, sadly, nothing is going to happen to help Lorna overcome the prejudices of others dealing with her. Claire Penny is regarded as a bleeding heart teacher. She has taught in the same school for years, cares deeply about the pupils and is somewhat ridiculed by her peers. 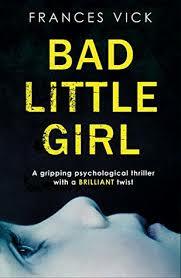 When she comes across young Lorna Bell there are definite suggestions that things aren’t right with the family, but Claire is manipulated into a dangerous situation. Initially, the novel focuses on Claire and the extent to which an event in her past seems to have shaped her reaction to the pupils she teaches. She comes across as naive but well-meaning. As the novel progresses we come to a much less credible scenario. There’s a definite sense of us not wanting to distrust Lorna-nowadays there’s too much potential for it to go wrong-but everything about her is just a little too calculating, a little too knowing and I found myself wondering just how far this would go. Vick takes this story way beyond where it might have seemed credible into far-fetched territory. There may be readers who like the character of Marianne, and I suppose she does allow a Claire to take a step back from the situation, but I find it hard to believe that two grown women would get themselves into this scenario and also allow a child to terrorise them in the way Lorna does. Sadly, for me, this was a book that was an interesting premise but just went into incredible territory and lost me. Thanks to NetGalley for the ARC in exchange for my thoughts.